Rebecca Dunlap, pointed out Tullis as the killer of her father. David Wilson Tullis, third son (fourth child) of David Tullis and Euphemia Wilson was born in Cupar, Fifeshire, Scotland, 3 June, 1833. He was a MORMON SHOOTER, and CLUBBER and a pvt. in the Iron County Militia. 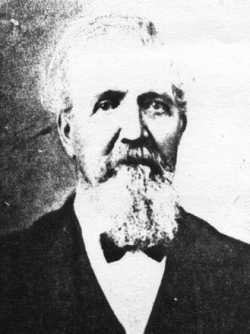 Mr. Tullis, at the time of the massacre, was working for Jacob Hamblin, on the Hamblin ranch. Jacob Hamblin, set up the Massacre, on the pre-determined site, on his ranch at Mountain Meadows. Mr. Tullis was a private in the Iron County Militia and was listed as being a participant in the massacre by eyewitness accounts, The 1857 Iron County Militia Project, and by the famous western historian Will Bagley, author of the book "BLOOD OF THE PROPHETS". 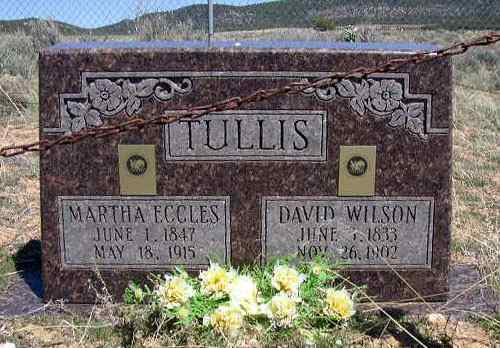 Above is David Tullis' headstone in the Pinto, Utah cemetery. His victims weren't allowed a CHRISTIAN burial or a headstone. Read the OATH of VENGEANCE taken by Tullis and other MORMON SHOOTERS & CLUBBERS. *Note: Dr. Forney related that when he took the surviving children to Santa Clara, Utah, to purchase clothes for them prior to their trip back to Arkansas, that Rebecca Dunlap saw David Tullis, pointing to him advising Dr. Forney that Tullis was the man that murdered her father. Story in Weekly Stockton Democrat. *NOTE: Almost all of us descendants of the Massacre Victims feel sorry for the Mormon particpant descendants but when they write obvious untruths about thier ancestor participant's roll in the massacre or try to justify the massacre like many Mormons do by pointing out Haun's Mill, the Parley Pratt murder, the alleged Joseph Smith martyrdom and the alleged persecutions in Illinois and Missouri. There is absolutely nothing that can justify the cowardly, cold blooded killings at Mountain Meadows, no, not even BRIGHAM YOUNGS'S GREED! The good LORD will make the final judgment not us. "David had found out that the massacre was being planned and that men were being rounded up to help with the killing. He did not want to take part in it, so with the aid of three of his friends, Sister Harrison, Sister Thornton, and Sister Knell he formed a plan to keep from going. They put him to bed with hot bricks around him and put hot packs on his head. By the time the men came for him he had the appearance of having a high fever. This and a few well timed groans were enough to convince them he was in no condition to go". Deseret was a therocacy and Mr. Tullis', aforementioned far fetched act, if true would have been considered an act of treason and the mildest punishment he would have received would have been to of had his throat cut. Having his throat cut would have allowed him a place in Mormon Heaven, under Brigham Young's rules of Blood Atonement. Our ancestors were not from Missouri like Mr. Tullis' descendants would like you to believe. THE WAGON TRAIN WAS FROM ARKANSAS. CLICK ON IMAGE TO READ THIS MORMON PARTICIPANTS LIFE STORY. Site information on this Mormon Shooter and Clubber, was contributed by MARK MOULTON, and the following sources: Pioneers and Prominent Men of Utah, Bagley, Lynch and Shirts.